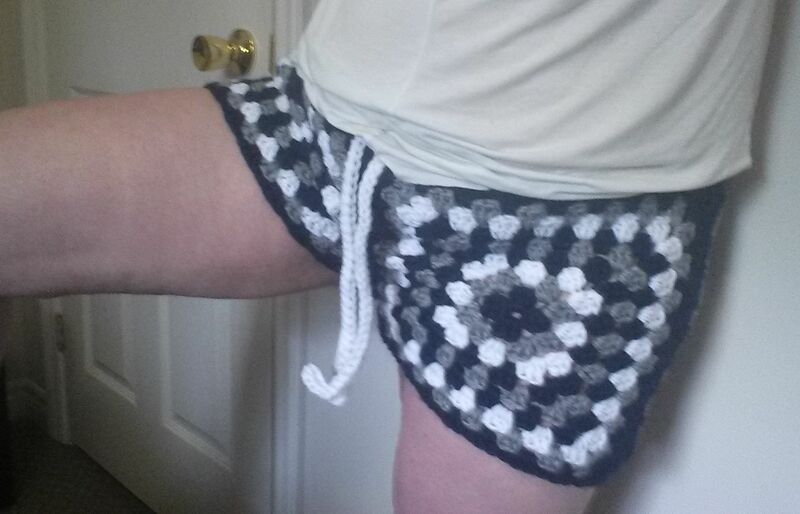 If you can make a granny square, then you can make these shorts! 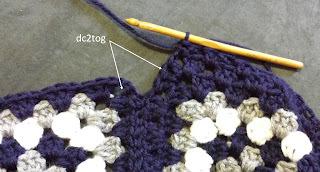 Actually, I’ve written out the granny square instructions to help you out, if you’re new to this popular, highly used, and awesome square motif! 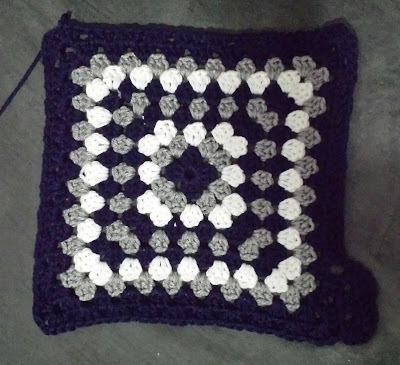 If you already know how to make a granny square, then you can just follow the color changes up until the last row. 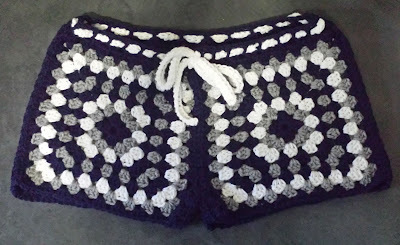 The last row of each square is altered to add the “gusset” or crotch in the same fashion as denim shorts. 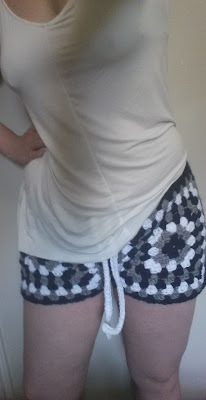 From here, the motifs are sewn together to form the shorts. 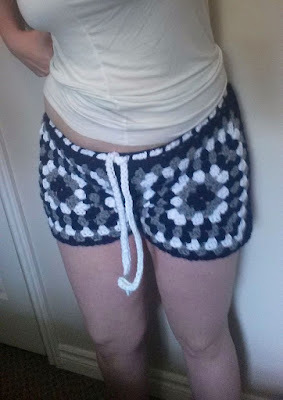 They will look big at this point, so here’s where the waist is shaped in 3 simple rows. 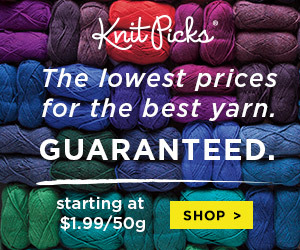 I chose navy, grey, and white worsted weight yarns, mainly because I had them in my stash already! So get creative and use whatever colors you want. These would look pretty nice in one solid color as well. (Navy) Ch5, sl st in 1st ch to form a loop. Rnd 1 (Navy): Ch5 (counts as 1dc and first ch2 space), (3dc-ch2 in loop) 3 times; 2dc in loop, sl st in 3rd ch of beginning ch5 to join. Rnd 2 (Grey): Sl st in 1st ch2 space; ch5, shell in same ch2 space; *(shell-ch2-shell) in next ch2 space** 3 times; 2dc in first ch2 space, sl st in 3rd ch of beginning ch5 to join (completes last shell). Rnd 3 (White): Sl st in 1st ch2 space; ch5, shell in same ch2 space; *shell in next space, (shell-ch2-shell) in next ch2 space** 3 times; shell in next space, 2dc in first ch2 space, sl st in 3rd ch of beginning ch5 to join. Rnd 4 (Navy): Sl st in 1st ch2 space; ch5, shell in same ch2 space; *(shell in next space) twice, (shell-ch2-shell) in next ch2 space** 3 times, (shell in next space) twice, 2dc in first ch2 space, sl st in 3rd ch of beginning ch5 to join. Rnd 5 (Grey): Sl st in 1st ch2 space; ch5, shell in same ch2 space; *(shell in next space) 3 times, (shell-ch2-shell) in next ch2 space** 3 times, (shell in next space) 3 times, 2dc in first ch2 space, sl st in 3rd ch of beginning ch5 to join. X SMALL ONLY (LAST RND) – Rnd 6 (Navy): Sl st in 1st ch2 space; ch5, shell in same ch2 space; (shell in next space) 4 times, (shell-ch2-shell) in next ch2 space; (shell in next space) 4 times, (shell-ch2-3HDC) in next ch2 space; 3HDC in next space; ch2, TURN; 3HDC in next space, 3HDC in ch2 space; ch3, TURN; shell in next space, 6dc in next space; (shell in next space –of last rnd-) 3 times, (shell-ch2-shell) in next ch2 space; (shell in next space) 4 times, 2dc in first ch2 space, sl st in 3rd ch of beginning ch5 to join. Fasten off, leaving a long tail for sewing. SMALL, MEDIUM, LARGE, and X LARGE ONLY - Rnd 6 (Navy): Sl st in 1st ch2 space; ch5, shell in same ch2 space; *(shell in next space) 4 times, (shell-ch2-shell) in next ch2 space** 3 times, (shell in next space) 4 times, 2dc in first ch2 space, sl st in 3rd ch of beginning ch5 to join. SMALL ONLY (LAST RND) – Rnd 7(Navy): Sl st in 1st ch2 space; ch5, shell in same ch2 space; (shell in next space) 5 times, (shell-ch2-shell) in next ch2 space; (shell in next space) 5 times, (shell-ch2-3HDC) in next ch2 space; 3HDC in next space; ch2, TURN; 3HDC in next space, 3HDC in ch2 space; ch3, TURN; shell in next space, 6dc in next space; (shell in next space –of last rnd-) 4 times, (shell-ch2-shell) in next ch2 space; (shell in next space) 5 times, 2dc in first ch2 space, sl st in 3rd ch of beginning ch5 to join. Fasten off, leaving a long tail for sewing. MEDIUM, LARGE and X LARGE ONLY - Rnd 7 (White): Sl st in 1st ch2 space; ch5, shell in same ch2 space; *(shell in next space) 5 times, (shell-ch2-shell) in next ch2 space** 3 times, (shell in next space) 5 times, 2dc in first ch2 space, sl st in 3rd ch of beginning ch5 to join. MEDIUM ONLY (LAST RND) – Rnd 8 (Navy): Sl st in 1st ch2 space; ch5, shell in same ch2 space; (shell in next space) 6 times, (shell-ch2-shell) in next ch2 space; (shell in next space) 6 times, (shell-ch2-3HDC) in next ch2 space; 3HDC in next space; ch2, TURN; 3HDC in next space, 3HDC in ch2 space; ch3, TURN; shell in next space, 6dc in next space; (shell in next space –of last rnd-) 5 times, (shell-ch2-shell) in next ch2 space; (shell in next space) 6 times, 2dc in first ch2 space, sl st in 3rd ch of beginning ch5 to join. Fasten off, leaving a long tail for sewing. LARGE and X LARGE ONLY - Rnd 8 (Grey): Sl st in 1st ch2 space; ch5, shell in same ch2 space; *(shell in next space) 6 times, (shell-ch2-shell) in next ch2 space** 3 times, (shell in next space) 6 times, 2dc in first ch2 space, sl st in 3rd ch of beginning ch5 to join. LARGE and X LARGE ONLY (LAST RND) - Rnd 9 (Navy): Sl st in 1st ch2 space; ch5, shell in same ch2 space; (shell in next space) 7 times, (shell-ch2-shell) in next ch2 space; (shell in next space) 7 times, (shell-ch2-3HDC) in next ch2 space; 3HDC in next space; ch2, TURN; 3HDC in next space, 3HDC in ch2 space; ch3, TURN; shell in next space, 6dc in next space; (shell in next space –of last rnd-) 6 times, (shell-ch2-shell) in next ch2 space; (shell in next space) 7 times, 2dc in first ch2 space, sl st in 3rd ch of beginning ch5 to join. Fasten off, leaving a long tail for sewing. Rnd 1 (Navy): Ch5 (counts as 1dc and first ch2 space), [3dc-ch2 in loop] 3 times; 2dc in loop, sl st in 3rd ch of beginning ch5 to join. X SMALL ONLY (LAST RND)- Rnd 6 (Navy): Sl st in 1st ch2 space; ch5, shell in same ch2 space; (shell in next space) 4 times, (shell-ch2-shell) in next ch2 space; (shell in next space) 3 times, 3HDC in next space, 3HDC in next ch2 space; ch2, TURN; (3HDC in next space) twice; TURN; 6dc in next space, (shell-ch2-1dc) in ch2 space; shell in next ch2 space (of last rnd); (shell in next space) 4 times, (shell-ch2-shell) in next ch2 space; (shell in next space) 4 times, 2dc in first ch2 space, sl st in 3rd ch of beginning ch5 to join. Fasten off, leaving a long tail for sewing. SMALL, MEDIUM, LARGE, and X LARGE ONLY- Rnd 6 (Navy): Sl st in 1st ch2 space; ch5, shell in same ch2 space; *(shell in next space) 4 times, (shell-ch2-shell) in next ch2 space** 3 times, (shell in next space) 4 times, 2dc in first ch2 space, sl st in 3rd ch of beginning ch5 to join. SMALL ONLY (LAST RND) – Rnd 7(Navy): Sl st in 1st ch2 space; ch5, shell in same ch2 space; (shell in next space) 5 times, (shell-ch2-shell) in next ch2 space; (shell in next space) 4 times, 3HDC in next space, 3HDC in next ch2 space; ch2, TURN; (3HDC in next space) twice; TURN; 6dc in next space, (shell-ch2-1dc) in ch2 space; shell in next ch2 space (of last rnd); (shell in next space) 5 times, (shell-ch2-shell) in next ch2 space; (shell in next space) 5 times, 2dc in first ch2 space, sl st in 3rd ch of beginning ch5 to join. Fasten off, leaving a long tail for sewing. MEDIUM ONLY (LAST RND) – Rnd 8 (Navy): Sl st in 1st ch2 space; ch5, shell in same ch2 space; (shell in next space) 6 times, (shell-ch2-shell) in next ch2 space; (shell in next space) 5 times, 3HDC in next space, 3HDC in next ch2 space; ch2, TURN; (3HDC in next space) twice; TURN; 6dc in next space, (shell-ch2-1dc) in ch2 space; shell in next ch2 space (of last rnd); (shell in next space) 6 times, (shell-ch2-shell) in next ch2 space; (shell in next space) 6 times, 2dc in first ch2 space, sl st in 3rd ch of beginning ch5 to join. 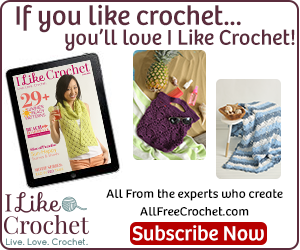 Fasten off, leaving a long tail for sewing. LARGE and X LARGE ONLY (LAST RND) - Rnd 9 (Navy): Sl st in 1st ch2 space; ch5, shell in same ch2 space; (shell in next space) 7 times, (shell-ch2-shell) in next ch2 space; (shell in next space) 6 times, 3HDC in next space, 3HDC in next ch2 space; ch2, TURN; (3HDC in next space) twice; TURN; 6dc in next space, (shell-ch2-1dc) in ch2 space; shell in next ch2 space (of last rnd); (shell in next space) 7 times, (shell-ch2-shell) in next ch2 space; (shell in next space) 7 times, 2dc in first ch2 space, sl st in 3rd ch of beginning ch5 to join. Fasten off, leaving a long tail for sewing. Rnd 6 (Navy): Sl st in 1st ch2 space; ch5, shell in same ch2 space; *(shell in next space) 4 times, (shell-ch2-shell) in next ch2 space** 3 times, (shell in next space) 4 times, 2dc in first ch2 space, sl st in 3rd ch of beginning ch5 to join. X SMALL ONLY (LAST RND) – Rnd 7 (Navy): Sl st in 1st ch2 space; ch5, shell in same ch2 space; *(shell in next space) 5 times, (shell-ch2-shell) in next ch2 space** twice; shell in next space; ch3, TURN; shell in next space, shell in ch2 space; ch3, TURN; shell in next space, 6dc in next space; shell in next space –of last rnd, (shell in next space) 3 times, (shell-ch2-shell) in next ch2 space; (shell in next space) 5 times, 2dc in first ch2 space, sl st in 3rd ch of beginning ch5 to join. Fasten off. SMALL, MEDIUM, LARGE and X LARGE ONLY - Rnd 7 (White): Sl st in 1st ch2 space; ch5, shell in same ch2 space; *(shell in next space) 5 times, (shell-ch2-shell) in next ch2 space** 3 times, (shell in next space) 5 times, 2dc in first ch2 space, sl st in 3rd ch of beginning ch5 to join. SMALL ONLY (LAST RND) – Rnd 8 (Navy): Sl st in 1st ch2 space; ch5, shell in same ch2 space; *(shell in next space) 6 times, (shell-ch2-shell) in next ch2 space** twice; shell in next space; ch3, TURN; shell in next space, shell in ch2 space; ch3, TURN; shell in next space, 6dc in next space; shell in next space –of last rnd, (shell in next space) 4 times, (shell-ch2-shell) in next ch2 space; (shell in next space) 6 times, 2dc in first ch2 space, sl st in 3rd ch of beginning ch5 to join. Fasten off. MEDIUM, LARGE and X LARGE ONLY - Rnd 8 (Grey): Sl st in 1st ch2 space; ch5, shell in same ch2 space; *(shell in next space) 6 times, (shell-ch2-shell) in next ch2 space** 3 times, (shell in next space) 6 times, 2dc in first ch2 space, sl st in 3rd ch of beginning ch5 to join. MEDIUM ONLY (LAST RND) – Rnd 9 (Navy): Sl st in 1st ch2 space; ch5, shell in same ch2 space; *(shell in next space) 7 times, (shell-ch2-shell) in next ch2 space** twice; shell in next space; ch3, TURN; shell in next space, shell in ch2 space; ch3, TURN; shell in next space, 6dc in next space; shell in next space –of last rnd, (shell in next space) 5 times, (shell-ch2-shell) in next ch2 space; (shell in next space) 7 times, 2dc in first ch2 space, sl st in 3rd ch of beginning ch5 to join. Fasten off. LARGE and X LARGE ONLY - Rnd 9 (Navy): Sl st in 1st ch2 space; ch5, shell in same ch2 space; *(shell in next space) 7 times, (shell-ch2-shell) in next ch2 space** 3 times, (shell in next space) 7 times, 2dc in first ch2 space, sl st in 3rd ch of beginning ch5 to join. LARGE and X LARGE ONLY (LAST RND) - Rnd 10 (Navy): Sl st in 1st ch2 space; ch5, shell in same ch2 space; *(shell in next space) 8 times, (shell-ch2-shell) in next ch2 space** twice; shell in next space; ch3, TURN; shell in next space, shell in ch2 space; ch3, TURN; shell in next space, 6dc in next space; shell in next space –of last rnd, (shell in next space) 6 times, (shell-ch2-shell) in next ch2 space; (shell in next space) 8 times, 2dc in first ch2 space, sl st in 3rd ch of beginning ch5 to join. Fasten off. X SMALL ONLY (LAST RND) – Rnd 7 (Navy): Sl st in 1st ch2 space; ch5, shell in same ch2 space; (shell in next space) 5 times, (shell-ch2-shell) in next ch2 space; (shell in next space) 5 times, shell in next ch2 space; ch3, TURN; (shell in next space) twice; TURN; 6dc in next space, (shell-ch2-1dc) in ch3 space; shell in next ch2 space –of last rnd; (shell in next space) 5 times, (shell-ch2-shell) in next ch2 space; (shell in next space) 5 times, 2dc in first ch2 space, sl st in 3rd ch of beginning ch5 to join. Fasten off. SMALL, MEDIUM, LARGE and X LARGE ONLY- Rnd 7 (White): Sl st in 1st ch2 space; ch5, shell in same ch2 space; *(shell in next space) 5 times, (shell-ch2-shell) in next ch2 space** 3 times, (shell in next space) 5 times, 2dc in first ch2 space, sl st in 3rd ch of beginning ch5 to join. SMALL ONLY (LAST RND) – Rnd 8 (Navy): Sl st in 1st ch2 space; ch5, shell in same ch2 space; (shell in next space) 6 times, (shell-ch2-shell) in next ch2 space; (shell in next space) 6 times, shell in next ch2 space; ch3, TURN; (shell in next space) twice; TURN; 6dc in next space, (shell-ch2-1dc) in ch3 space; shell in next ch2 space –of last rnd; (shell in next space) 6 times, (shell-ch2-shell) in next ch2 space; (shell in next space) 6 times, 2dc in first ch2 space, sl st in 3rd ch of beginning ch5 to join. Fasten off. MEDIUM ONLY (LAST RND) – Rnd 9 (Navy): Sl st in 1st ch2 space; ch5, shell in same ch2 space; (shell in next space) 7 times, (shell-ch2-shell) in next ch2 space; (shell in next space) 7 times, shell in next ch2 space; ch3, TURN; (shell in next space) twice; TURN; 6dc in next space, (shell-ch2-1dc) in ch3 space; shell in next ch2 space –of last rnd; (shell in next space) 7 times, (shell-ch2-shell) in next ch2 space; (shell in next space) 7 times, 2dc in first ch2 space, sl st in 3rd ch of beginning ch5 to join. Fasten off. LARGE and X LARGE ONLY (LAST RND) - Rnd 10 (Navy): Sl st in 1st ch2 space; ch5, shell in same ch2 space; (shell in next space) 8 times, (shell-ch2-shell) in next ch2 space; (shell in next space) 8 times, shell in next ch2 space; ch3, TURN; (shell in next space) twice; TURN; 6dc in next space, (shell-ch2-1dc) in ch3 space; shell in next ch2 space –of last rnd; (shell in next space) 8 times, (shell-ch2-shell) in next ch2 space; (shell in next space) 8 times, 2dc in first ch2 space, sl st in 3rd ch of beginning ch5 to join. Fasten off. 1. 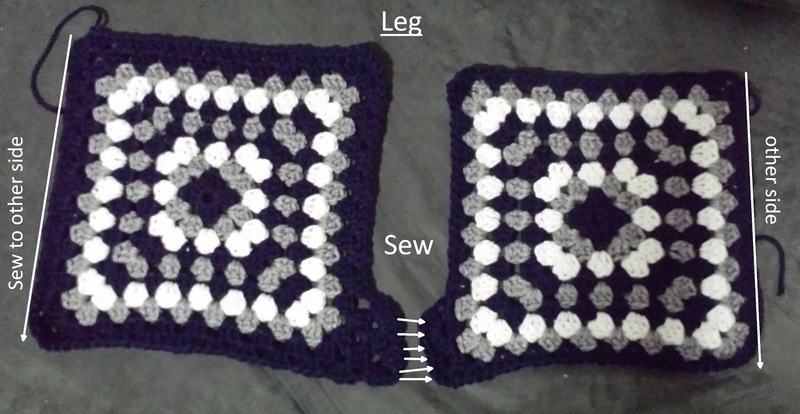 Line up one Front leg to matching Back leg (Right sides facing out) so that the gusset is facing each other. 2. 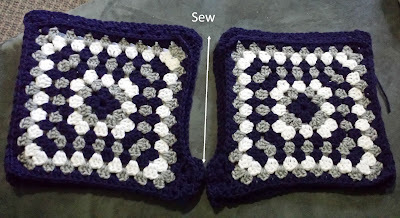 Sew gusset edge together, starting from bottom ch2 space, and through next 7dc. Fasten off. Sew in end. 3. Sew side edge together with long tail (from front leg), leaving the extra 3dc and ch2 of Back Leg at top unworked, so that the bottoms line up. Fasten off. Sew in end. 4. Repeat Steps 1-3 for next leg. 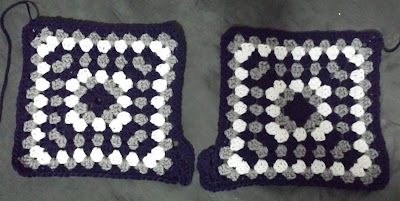 - Line up center (unsewn side) of legs toward each other (right sides facing out). 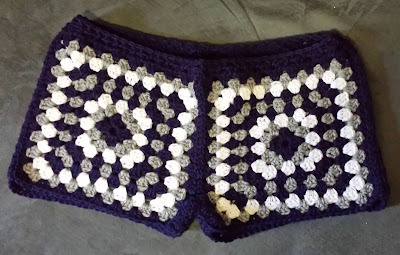 Using a long strand of your main color (Navy), sew evenly together, from the top of the fronts, down around the gusset (crotch) and up towards the top of the back. Fasten off. Sew in ends. *Note: Your shorts probably look really big right now! And the back side is higher than the front side! Don’t worry, we will now shape the waist! 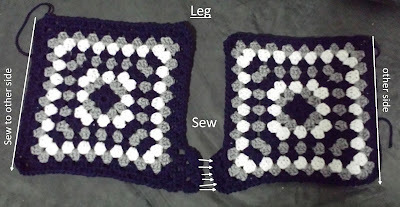 -attach Main color to back (rear) seam in the left ch2 space of granny square, with a sl st.
Rnd 3: Ch1, sc in each st around, sl st in 1st sc to join. Fasten off. Sew in ends. Optional Drawstring: Ch desired length of yarn, OR use ribbon or another material and weave through the dc sts of Rnd 2. So cool!! I love it. 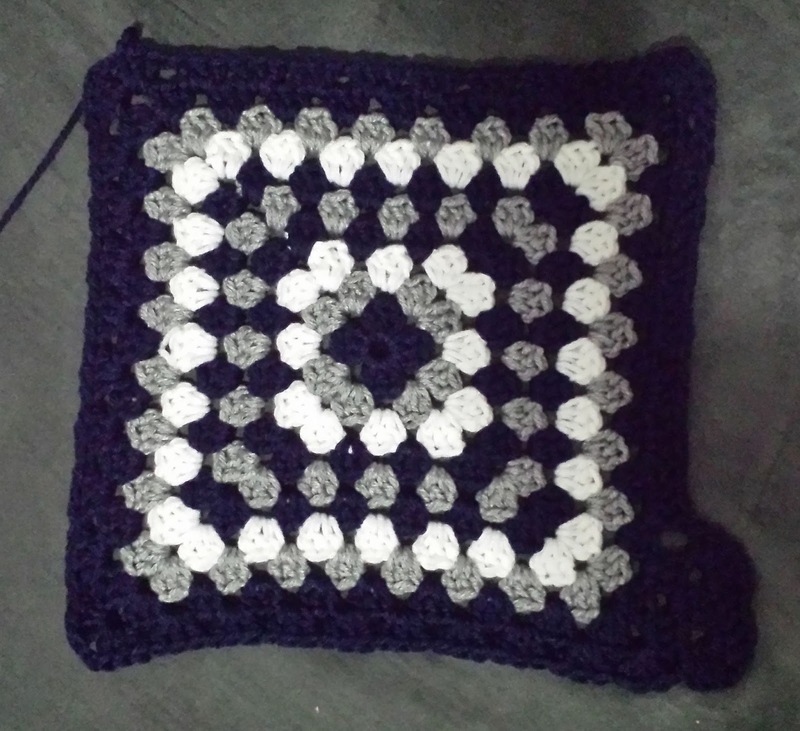 What sizes are the squares? 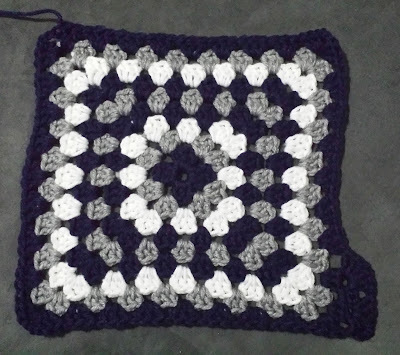 The gauge would be a granny square up to Rnd3 = 4 inches. So (front) finished squares up to the last rnd are XL=11.5", L=10.5", M=9.5", S=8.5", XS=7.25". 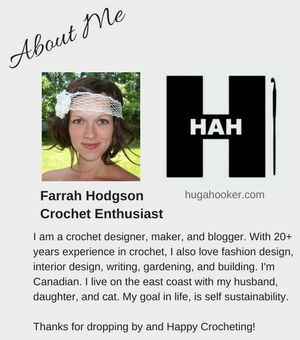 Thank You, Can a use a smaller size yarn and hook, it kinda bulky for me. Thank you, I am glad you like it! I can't say thank you enough for sharing this pattern. My oldest daughter loves the granny square pattern and has wanted me to make shorts for her. 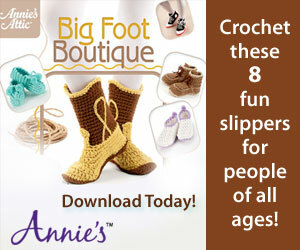 I can't wait to surprise her with a pair. I hope to start them in the next day or so. Again thank you! Perfect! 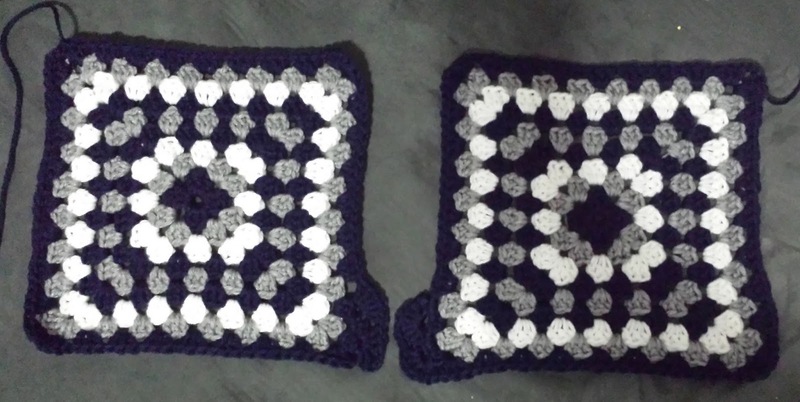 I am glad you like them, these are fun to make:) I hope she likes them too! Just to clarify - there is no ch 2 in between the shells along the sides? Okay, I have to ask this...under duress. lol. 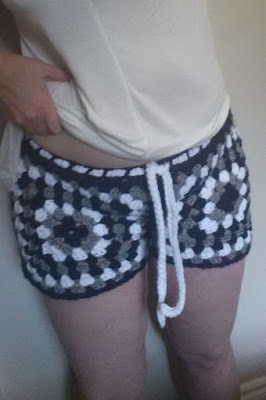 If I'm going to make these for a guy, how would you suggest editing the pattern? 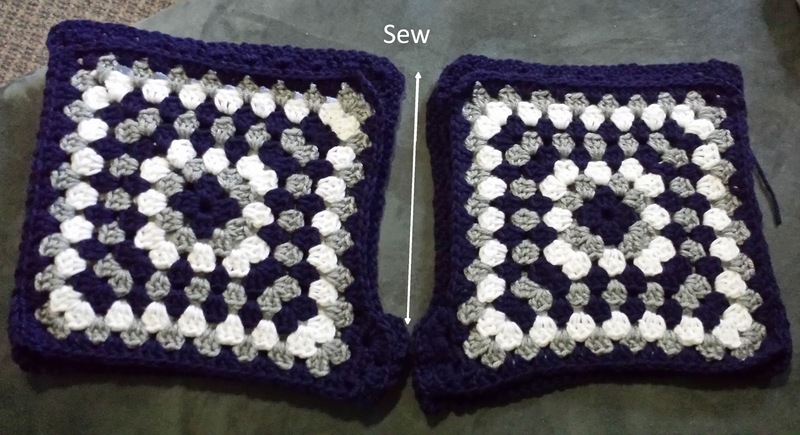 Maybe add length by adding two more squares in the front and back on the bottom and whip stitching them together? ok, i will try asking them. thanks so much!